We are telling a lot of stories here at the Pacific Fishery History Project, and since we have trouble keeping them straight, we’re sure it’s a problem for our loyal readers. Postings tend to be more than a little random. The blog is like a small town where Bob and I know everybody, but nobody else knows anybody. The blog is home ported (so to speak) in Astoria, Oregon, at the mouth of the mighty Columbia River. But it is Astoria in 1947, a very particular point in time in terms of fisheries development . 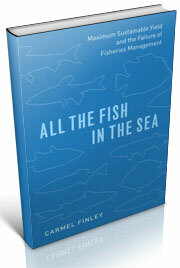 I set the blog up six years ago, as I was writing my first book, All the Fish in the Sea. 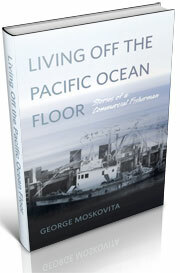 I wanted OSU Press to republish George Moskovita’s memoir. I knew it would need an introduction and I needed to learn more about Pacific fisheries history. As I read, I started to write little posts. One of the early readers was a retired federal scientist, Bob Hitz, who always wanted to write a book about his adventures onboard the federal research ship John N. Cobb. He started with a blog post and now he’s writing his book. Between us we’ve written about 150 posts about the development of fisheries and fisheries science after World War II. Most of our posts fall into eight main categories, but all of the posts are connected, either by the people, the boats, the fish, or other events. For the first time, we’re doing an inventory of our material, and linking posts together. Our posts are labeled, CF means I wrote the post, BH means it came from blog. We also include the date of original publication. Most of the scholarly attention and journalistic interest in fisheries is devoted to the Atlantic Ocean, where fisheries developed over hundreds of years. Development in the Pacific was completely different, with fisheries starting and crashing; sometimes in less than a decade (check out our posts on Oregon’s first fishing crash). There are some West Coast fish (salmon springs to mind) with a rich and considerable literature. Our interest is in the industrial fishery and the science around it. 1) Our story begins in 1945, when President Harry Truman visited Seattle and went salmon fishing. The man rowing the presidential rowboat was Nick Bez, one of the richest men in the Northwest, owner of canneries and gold mines and the world’s largest fish processing boat. There are currently a dozen blog posts that tell the story of one of the Northwest’s most popular businessmen. 2) Exploratory fishing is also a major theme of the blog. The Soviets, the Japanese, and the Americans all engaged in exploring for new fish stocks after World War II. This was the process that brought the Soviets to Oregon, where they decimated POP stocks. 3) Fish. We are interested in fish. We have a series of posts about California sardines and Oregon pilchards, and how the California fishery stimulated fishery development in Oregon. We also have a long series of posts on Sebastes Alutus, which are also known as redfish, roses, Pacific Ocean Perch, or POP. 4). Scientists. I am a historian of science and I am interested in how science is created, and the context in which it is done. There are three pages here, dealing with a variety of modern fishery scientists, then posts on Dayton Lee Alverson and Jergen Westheim. 5) Boats. We like boats. And pictures of boats. The main boat in the blog is the federal research vessel John N. Cobb. Now retried from service, the Cobb was the primary research vessel on the Pacific coast since it was built in 1950. Our blog posts here divided in the history of Cobb, and Bob’s adventures on the Cobb. We also have a page for the Pacific Flyer, . 6) George Moskovita is one of the constant threads that runs throughout the blog. George fished for sardines in California in the 1930s, was one of the first fishermen to trawl out of Astoria in 1940, and he helped develop the shark fishery during World War II. Oregon State University has republished George’s memoir. 7) The Soviet Fishery of the 1960s. Some of the blog’s best posts are by Bob Hitz, who was one of the federal scientists studying the Soviet fleet. 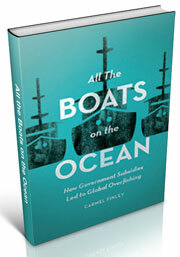 8) Post-war global fisheries development. We’re primarily interested in West Coast fisheries, but we also have considerable interest in post-war fisheries in general. For a general introduction, let’s start with Astoria, Oregon, in 1947. This entry was posted in California sardines, Dayton Lee Alverson, Environmental History, Exploratory Fishing Base, fisheries science, Fishing, George Moskovita, History of Science, History of Technology, Maritime History, Nick Bez, Ocean fishing, Oregon pilchards, Overfishing, Pacific Explorer, Pacific Fishing History Project, R/V John N. Cobb, Rosefish, Sebastes rockfish, Soviet environmental history, Soviet fishing, Soviet history'. Bookmark the permalink.